Florencia Ramirez: How Much Water Do You “Eat"? 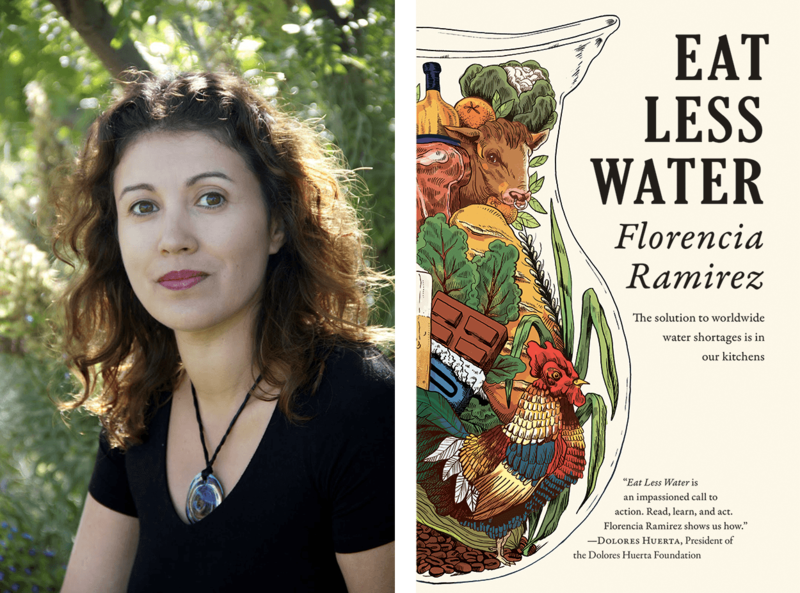 Florencia Ramirez is a trained researcher at the University of Chicago's School of Public Policy and author of the book Eat Less Water (not to mention an activist, educator and mother!). Today, she talks with us about how conserving water—perhaps the most precious resource on our planet—involves a lot more than simply taking shorter showers. In doing so, Florencia breaks down the idea of a “virtual water footprint,” the relationship between our water and our soil, and why the solution to water scarcity is truly in our kitchens. Why and how the food industry has the largest virtual water footprint of any industry in the United States. How many gallons of virtual water go into the food we eat every day. Why soil health is such an important piece of water conservation, and what microbiology has to do with that. Different “colors” of water—ever heard of blue water? How about green water? Gray? Why simply reaching for organic food at the supermarket is a form of water conservation. THERESA MARQUEZ: Hello, and welcome to Rootstock Radio. I’m Theresa Marquez, and I’m here today with Florencia Ramirez, a trained researcher at the University of Chicago School of Public Policy, but she’s also an author, a mother, an educator, an activist. Florencia is the author of Eat Less Water. Welcome, Florencia. FLORENCIA RAMIREZ: Thank you. Thank you for having me. TM: Just a delight to have you. What a fun title: Eat Less Water. Can you tell us a little bit, Florencia, how did you start to think about writing a book like this? FR: Well, it started in the shower, actually, 10 years ago. FR: Yeah, yeah. I’d just given birth to my daughter, Estrella. And I was in California, and it was two droughts ago. And during the drought, they always roll out the same things that we should think about, which is take shorter showers, and turn off the tap—you know, it’s the same directives. And I started to research books about water conservation and what was happening to our rivers and water cycles. So I come across this book called When the Rivers Run Dry. And in the very beginning of the book, the author talks a little bit about this whole concept of virtual water footprint. And it was new to me, that term, and I think it’s new to a lot of your listeners. And essentially what that is, is how much water does it take to produce a good or service. So it’s water that’s embedded in a product. For example, my shower has a water footprint of, you know, if I’m taking a five-minute shower, it’s a ten-gallon water footprint. But the virtual water footprint is something like in the clothes that I’m wearing, or the chair I’m sitting on. So it turns out that the largest virtual water footprint is in the food that we eat. So when I was talking about how we could save 2,500 gallons of water in a year, with shortening our showers, it turns out that we could save that much in a week, in our kitchens, because we, in the United States, eat anywhere between 500 to 1,300 gallons of virtual water every day in the food that we eat. So that’s where the book Eat Less Water came from. TM: Well it was so fun—actually, I don’t know exactly if fun is the right word—to be looking through your book. I guess we should start in the first chapter, only because I love bread so much, and I love to bake, that one slice of bread is 11 gallons of water. FR: Right, so that is what’s embedded in that bread. That is the average of how much water it takes to grow the wheat and the ingredients that are in that bread. So you can do it for rice, for example. A pound of rice is 300 gallons of water; a glass of wine, 32 gallons of water; a glass of milk, 45 gallons of water; a pound of butter, 3,602 gallons of water. So the higher up you go on the food chain, the more water is being used because then you’re looking at how much water does it take to grow an animal, or to keep an animal healthy and alive—for example, for a dairy cow—so that they could then produce the cheese and the milk. So that’s how they do that calculation. So if I’m really concerned with how water is being used on this planet, how can I, as one single eater, make a difference on water systems? And can I make a difference on water systems by making different choices of food? Does that mean that, for example, I shouldn’t drink that milk or not have that bar of chocolate? Because a bar of chocolate is 449 gallons of water. So the way that I figured it out was to go to the source, to go out and seek farms and farmers that were really using the best techniques, the farm methods that used the least amount of water. I went to a farm in Paso Robles, California, and the farmer there, his name is John DeRosier, and his farm is called With The Grain. He has 200 acres of leased land in Paso Robles. Paso Robles, California, gets very hot. It has the same amount of rainfall as Phoenix, Arizona, so you get a sense of how dry it is. He has 200 acres of land that is kind of in this little valley surrounded by both almond trees and vineyards. And both of those farms in Paso Robles are drilling deeper and deeper into groundwater and sucking out water from underground at much faster rates than the water rain is able to replenish it. So, as a result, they’re having to go 10,000 feet deep now in some areas of Paso Robles in order to produce that wine that we love and those bags of almonds that we love. But I’m here at this farm with John DeRosier, and he has zero irrigation. And I didn’t understand, at first, how was that possible, that he could grow grain without using any irrigation. I come from Oxnard, California—everything is irrigated. We grow strawberries and lettuce and artichokes and broccoli, and everything is irrigated. Rain or shine, those sprinklers are going off. So I asked John this: How is that possible? And he takes me down to what he calls his “dirt laboratory” and he shows me this patch of cover crop. And he says, “This is how I’m doing it.” So he yanks some out of the ground and I see these dangling roots, and he said, “Within these roots, there’s all this microbiology, all these microorganisms that are keeping water in that soil.” So that was the aha moment for me, was to have this understanding that the answer to save water is really in our soil: how do we treat our soil. So on his farm, he’s doing all of these different farm techniques. He’s a biodynamic farmer, which was also a new term for me, which is organic but it’s going beyond organic. It really is about how do you build the microbiology in the soil. Because in one tablespoon of soil that’s alive with microbiology, there’s a billion microbes in that soil. And what they do is they’re able to hold water up to 1,000 times more than soil that’s been treated with chemicals. So then I started to look—I found this whole research around the colors of water, the designation of water. So blue water is water that comes from the ground, our groundwater—reservoirs, rivers, all that collected water. Green water is the water that falls from the sky. So that is the water that John is using on his farm. The bread that’s made from the wheat from John’s farm still uses 11 gallons of water on average, but the type of water is different. It is green water, it’s water that’s falling from the sky. It’s not being diverted from the water cycle. It’s not being pulled from the ground in an unsustainable fashion. That’s the big difference. So all of these farms that I travel to all around the country, they were all using farming methods that were able to use more of this green water, so that they didn’t have to use the blue water that we’re running out of. TM: Well, you know, it’s so funny because the next question I was going to ask you—I didn’t realize that water was described in three different ways. Isn’t there one more: gray water? FR: Mm-hmm. Gray water is water that’s polluted with nitrogen, and that’s a huge issue. Sixty-seven percent, I think is the statistic, of rivers in the United States are too polluted to carry life. And a big reason for that is agricultural. It’s runoff from our cropland and it’s runoff from our livestock. So, that nitrogen, which is to produce food, when there’s too much of it, it kills rivers. It’s what causes the dead zones. So that is what gray water is. Like, for example, in the dairy farm I visited in New York, that was the first time that I learned of the farming method called holistic managed. Holistic managed essentially is when a farmer tries to mimic what would naturally happen in nature. So in nature, animals would not be able to overgraze any particular farm grass area because a predator is coming. You know, it was always moving, those animals. So in the Africa grasslands, if it was in a natural setting, those elephants, for example, could never overgraze because here comes the lion behind them. So they’re constantly moving, like every week. Well, now that we’ve developed our land, and we’ve taken the predators off the land, we have these animals who are ruminant animals, who eat grass, but they can just eat and eat and eat grass until there is no grass left. And so they’re causing desertification. And when that happens, then those microorganisms start to die. And then when it does rain, that land starts to act more like pavement than it does act like a pasture. And everything, all the nutrients, including nitrogen, that are on that land just run off instead of penetrate deep into the groundwater systems. We’re just losing that water to evaporation and runoff. And it’s running off into our rivers that then lead to the lakes or lead to our oceans. So I go to this farm—Maureen and Paul Knapp are the farmers there—and they teach me how you can produce dairy or meat in a way that uses a whole lot less water and does not have any runoff, because anytime that there’s rain—because their soil acts like a sponge—there isn’t anything to run off. The water is being drawn downward, which is what we want. So how they do that is they have fenced paddocks. So there, Paul calls their cows “the girls,” so they put the girls on the paddock that is cordoned off with the fencing, and after a week they’re moved to a fresh piece of grass, so that those animals can never overgraze. Instead, they’re just giving back to the land with their manure and with their hooves just beating the microbiology in the soil. So that is a method that, unfortunately, a lot of us don’t know about—this holistic manages—but really is the best way to produce our food, our dairy, and our meat. So for myself, whenever I look at buying meat or dairy products, I’m always looking to support farms that are supporting holistic managed paddocks. TM: Well, you know, that is just a whole lot that you just went through. And I certainly am going to agree with you: grass-based agriculture is definitely a highly superior way to farm. But what I’m really appreciating is that so much of livestock is being demonized, in that it’s all the same, and it isn’t. I’m really impressed, when you got into this, you decided, “Gee, I am going to go on a learning journey. I’m going to visit farms.” How many farms have you visited? FR: So I visited over 20 farms for the book. It took me on a journey of 17,000 miles, and it took me six years to travel. I also had three young kids at the time, raising them—so that certainly slowed down the learning journey. But I wanted to tell a story that was not just California or the Southwest, because when we think about water scarcity, we have a tendency to think about California. But this water scarcity is not a California story. This is something that’s being repeated all over the United States, and certainly all over the world, with dropping groundwater tables, with rivers and reservoirs that are too dirty to use to be safe. So water scarcity comes from two reasons, or two ways. One is that there isn’t enough water, and the other is you could have plenty of water but if it’s too dirty you can’t use it. It’s something that we’re dealing with as a human population, because one billion people today don’t have a source for clean water. And the prediction is that by 2030, half the world population will not have enough water. So the solution is not in the shower, like I thought, but it truly is in the kitchen. And by extension, it is in our farms and in our factories that are producing our food, because that is where 70 percent of all freshwater flows. TM: Well, if you’re just joining us, you’re listening to Rootstock Radio, and I’m Theresa Marquez. And I’m here today with Florencia Ramirez, a trained researcher at the University of Chicago School of Public Policy. She’s an author and a mother, an educator, an activist. And we’re talking about her book, Eat Less Water. But you know what, Florencia, if we could back up just a little bit, one of the things that you found is that we can save a heck of a lot more water thinking about what we eat and how our food is grown, it sounds like. But what other things did you find out about with regards to some of the habits that we might think about changing as we learn more about just how much water our food production—70 percent, you just told us—takes from our freshwater? FR: One is when we reach for food that’s been grown organically, without pesticides, chemicals, or petrochemical fertilizers, just that one action alone is making a huge difference on water systems. Because as I mentioned, when we treat our soil with chemicals, we diminish the capacity of that soil to hold water, up to 1,000 times. So logically then it becomes, “Well, if I want to save water, then I need to think about what are the farming methods that will save water?” And that is organic farming. And then to go beyond that is to look some of these other farm methods that I write about in the book—like holistic managed, like biodynamic—that are really looking even further, kind of deeper than, kind of there’s this organic umbrella and then underneath that there’s these layers of what is organic. And the way, as an eater, to be engaged with that is to ask questions and to really vote with our wallets. Because these farms—like Maureen and Paul Knapp, who live in New York and have this holistic managed dairy farm, they’re producing nutritious milk that is not polluting water, and it’s using lots of green water instead of having to use blue water. That action step, just by going out and purchasing that gallon of milk and spending a few more dollars, is making a huge impact. Getting out to the farmers’ markets and meeting your small-scale farmers and asking questions and supporting them, because they cannot exist without us. And these sustainable farmers really are at the forefront of this movement, but they need us to back them up, because the system is not built to support that agriculture. The system is built to support large-scale corporate farming, chemical farming. The second thing is to waste less food. Here in the United States we throw anywhere between 30 to 50 percent of our food, and all of that food can be calculated in water. So in my own kitchen, I think about how not to waste so much food. One of the things I do is label. I’ve noticed that, because after publishing this book, I spend a lot more time with chefs. And I noticed that they use that blue painter’s tape. And every time that they put something in a container, they make sure that they label what it is and the date. And just that one action alone helps so that we don’t just shove things in the back of our refrigerator and forget about them. TM: We all know what that’s about! FR: Yes! And we open [them] up, we’re like, “What is that?” or, “I don’t know, is this good anymore?” And then we throw it away. And the other piece is planning. When you plan your meals, you waste a lot less food. So when you go to the grocery store, to have your plan for the week of what you’re going to cook. So, at my home I plan my meals on Sunday so I know what we’re going to eat for the entire week. And when I go to the grocery store and to the farmers’ market I know exactly what ingredients I need, so I’m not over-purchasing. And every ingredient that I’m putting inside of my cart or in my basket has a purpose that it will end up on a plate. And then also, for example, in my chicken chapter, every chapter ends with recipes, because that is the action step. So in the chicken recipe, there’s a recipe for a roasted chicken. And then the second recipe is Next Night Tortilla Soup. So it’s also building that into our week recipes. So we know that you’re going to make a chicken and you know you’re not going to eat the entire chicken. What can you make with the leftovers, right? So thinking about that. So that’s another way to minimize the waste that we have in our own kitchens. And what I love about these action steps is that they’re things that we can do. Like we can control those things. We can control the ingredients that come into our home. We control how we use those ingredients in our home. We control the stories that our food tells. Because our food does tell stories, either good ones or bad ones. And unfortunately in the United States today, a lot of the food that we find in our grocery stores and our restaurants and in our homes are not telling a very good story. TM: Well, you know, another thing too that I’ve noticed as I get older is it’s also good to know yourself and not put more on your plate than you think you’ll eat. TM: And I think of my mother nagging me, “Eat everything on your plate!” And I hadn’t realized, as I got older, that was good advice. But I wanted to ask you, we’ve been talking about soil—and this is a very common topic on our radio show—it’s underestimated as to just how powerful it is and how wonderful it is. It’s the soul of the earth, so to speak. But you have a chapter in here about aquaponics. And I was quite taken aback to see that actually aquaponics potentially can use less water, do you think? Can you say a little bit about aquaponics? Aquaponics can use less water. What’s interesting is that I talk about the distinction between aquaponics and hydroponics. So aquaponics is—when I went to his farm, into these hoop houses that house these floating farms—it’s the fish that are fertilizing the water. So if he adds any chemicals to that water, he’s going to kill his fish. So that was kind of, for me, the important distinction between aquaponics and hydroponics when it comes to water. Because the hydroponics system, even though it can be done organically, they don’t have the fish to worry about. So oftentimes hydroponics are not organic, and they are using chemicals to keep those plants growing. And the other thing I’ve realized as well, while I was doing the research for that chapter, is this whole distinction between closed loop system and an open looped system. So, again, going back to the farm in Texas, aquaponics, he had a closed looped system, which means that he’s used, that water is just being recirculated over and over again. So he has to refill, because when there’s evaporation, which naturally happens, but that’s how come he’s able to produce food with not a whole lot of water. In hydroponics there’s a lot of systems that are open, which means that the water is cycling through 24 hours a day. That faucet is on and it’s just going right out; it’s an open loop. So they turn it on, it goes through one time and out. So in that system, that’s highly water intensive. What I came to the conclusion with aquaponics in that farm is it was important for him to have the aquaponics in the summertime because in Texas you can’t produce lettuce in the ground during the summer; it’s too hot. But he can do it in these aquaponic systems in these hoop houses. But he doesn’t do it all year long. It’s one stream of income that allows him to do the farming that he has the rest of the year. TM: You know, I’m really taken with just how creative so many of these farms that you went are and the way they deal with energy, waste, and just how to make a living in farming, which can be very difficult. It must’ve been super eye-opening for you. I just want to make sure—Eat Less Water, a book by Florencia Ramirez. Florencia, do you have a website? FR: I do. It’s www.EatLessWater.com. I’m also on Facebook, Eat Less Water Now, and Instagram @EatLessWater. TM: And also, where can people find your book? FR: They can find it on Amazon, at Barnes and Noble, at your local bookstore. Also Audible, it’s available. TM: Oh, excellent! As I said, very fun. Each chapter, just about, is about a different farm and farmer. So many of us who just really want to see just how creative farming can be, and especially when it comes to thinking about how we use our resources. It’s just a great wealth of information. Florencia, thank you so much for sharing this with us today. And it’s such an inspiration to think that you went out, wanting to learning something, and you learned so much. I so thank you for sharing this with us. FR: Thank you! Thank you so much for having me on.